Back by popular demand – for the 9th time. They are closing their season once again with their deliberately uncensored re-imagination of the very first table reading of the original screenplay from Airplane! — the film ranked #10 on AFI’s 100 Funniest American Movies of All Time. Don’t miss Saturday’s Q&A with co-creator David Zucker immediately following the reading. TreePeople and the Actors Conservatory Ensemble are excited to announce the return of “Once Upon A Canyon Night” back for its 13th season, running on select weekends from July 10th through September. 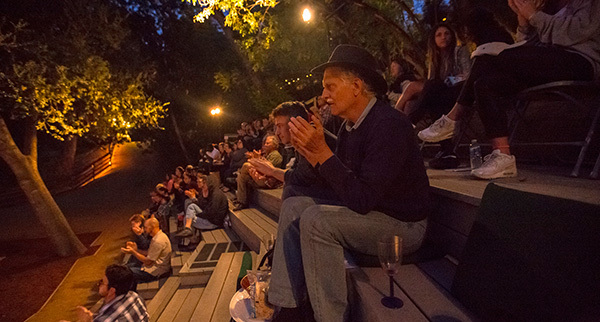 The summer entertainment series is nestled in the woods and set under the stars in TreePeople’s beautiful S. Mark Taper Foundation Amphitheatre at its park headquarters at the intersection of Coldwater Canyon and Mulholland Drive. The complete lineup features a poetry jam, comics, staged readings, and shows for the whole family. Check out the website for a full listing of performances. All proceeds directly benefit the maintenance and care of TreePeople’s beautiful 45acre Coldwater Canyon Park. Saturday Q&A with David Zucker.